Having the proper refrigeration equipment is the first important step in ensuring product safety and efficiency at your facility. You also need to have appropriate vaccine storage and handling practices and procedures in place. By doing so you can maintain vaccine quality and potency and also minimize waste. Provincially funded vaccines must be kept refrigerated between +2 C and +8 C at all times in order to retain their potency and to be effective. Strive to maintain vaccine refrigerator temperature at +5 C, as this gives a greater leeway for protection from temperature fluctuation. The internal refrigerator temperatures must be stabilized between +2 to +8 C for a recommended period of 7 consecutive days prior to stocking vaccines. Ensuring your refrigerator is properly organized can make all the difference in maintaining an efficient cold chain supply solution. The following pointers are some important and helpful tips in order to ensure safe handling practices for vaccine program and biomedical/pharmaceutical settings. Vaccines should be away from the refrigerator walls, floors and cold-air vents. If vaccines are kept against refrigerator walls, floors and cold air vents it increases the risk of exposing vaccines to temperatures below +2C. Vaccine packages should always have a little space between them to allow for air circulation. Avoid tightly packing and stacking the packages. Organize vaccines by-products. Place vaccines of the same type together. Check vaccine expiry dates regularly and after every vaccine order. Remember whatever has come in first should always be the first to go. Remember the acronym FIFO *(First In First Out). Vaccine expiry dates should always be checked before use. If expired, return them right away to vaccine supply source. Vaccine refrigerators must always and only be dedicated for the storage of vaccines. Food, beverages or other none medical related products should not be stored in vaccine storage units because this practice results in frequent door openings and destabilization of the temperature. In instances when the refrigerator is storing very few vaccine packages, place a few full water bottles throughout the unit which helps maintain an even, stable temperature. What vaccines need to be refrigerated? Store all other routinely recommended vaccines in a refrigerator between 2°C and 8°C. The desired average refrigerator vaccine storage temperature is 5°C. Exposure to temperatures outside these ranges may result in reduced vaccine potency and increased risk of vaccine-preventable diseases. Live vaccines are sensitive to heat. MMRV, varicella, and zoster vaccines must be stored in a continuously frozen state in a freezer at -15°C or colder until administration. MMRV, varicella, and zoster vaccines deteriorate rapidly after they are removed from the freezer. Measles, mumps, and rubella vaccine (MMR) is routinely stored in the refrigerator, but it also can be stored in the freezer. Inactivated vaccines are sensitive to both excessive heat and freezing. They should be stored in a refrigerator at 2° to 8°C, with a desired average temperature of 5°C. Exposure to temperatures outside this range results in decreased vaccine potency and increased risk of vaccine-preventable diseases. Inactivated vaccines may tolerate limited exposure to elevated temperatures, but they are cold sensitive and are damaged rapidly by freezing temperatures. Note Vaccines should not be stored in the freezer door. In the freezer, the vaccine should be stored in the middle of the compartment, away from the walls, coils, and peripheral areas. In the refrigerator, the vaccine should be stored in the middle of the compartment, away from the coils, walls, floor, and cold air vent. The temperature near the floor of the refrigerator is not stable and differs from that in the middle of the compartment. For this reason, the vaccine should never be stored in the vegetable bins. Vaccines should not be stored in the refrigerator door. The temperature in the door is not stable and differs from that in the main compartment. In a combination refrigerator-freezer unit, the top shelf of the refrigerator may be colder than the recommended temperature range because of cold air venting on it from the freezer. Refrigerated vaccines should always be stored far enough away from the air venting from the freezer compartment to avoid freezing the vaccines. Ideally, the vaccine should be stored on the middle shelf, away from the cold air vent. However, if the vaccine can be situated away from the cold air vent, and the temperature in this area is within the recommended range, the vaccine may also be stored on the upper shelf. If the upper shelf must be used for vaccine storage, it would be best to place MMR on this shelf because MMR is not sensitive to freezing temperatures like the other refrigerated vaccines. 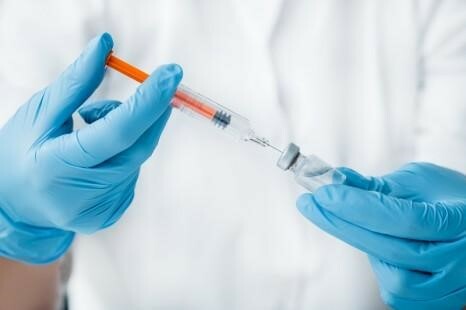 The vaccine should be placed with space between the vaccine and the compartment wall, and with space between each large box, block, or tray of vaccine to allow for cold air circulation around the vaccine. Adequate cold air circulation helps each vaccine to reach a consistent temperature throughout its mass and is necessary for the storage unit to maintain a consistent temperature inside the compartment. Packing any vaccine storage unit too tightly will affect the temperature. Vaccine products that have similar packaging should be stored in different locations to avoid confusion and medication errors. For example, if you have pediatric and adult versions of the same vaccine, storing them in different locations lessens the chance that someone will inadvertently choose the wrong vaccine. Likewise, vaccines that have similar sounding names should be stored in different locations. For example, DTaP and Tdap vaccines might be easily confused, as could Hib and hepatitis B vaccines. Note Diluents may be stored in the refrigerator door. Vaccines should not be stored in the refrigerator door. In the refrigerator, the vaccine should be stored in the middle of the compartment, away from the walls and coils and off the floor. The location of each specific vaccine inside the storage unit should be clearly labeled. This can be accomplished by attaching labels directly to the shelves on which the vaccines are sitting or by labeling containers in which boxes of the same vaccine type are placed. Storing each vaccine in its own specifically labeled section of the refrigerator or freezer helps decrease the chance that someone will mistakenly administer the wrong type of vaccine. In addition to labeling the location of vaccines, mark each opened multidose vial with the date it was first opened. Mark reconstituted vaccine with the date and time it was reconstituted. Dating these vials is important for two reasons. First, some vaccines expire within a certain time after opening or after reconstitution. This may not correspond to the expiration date printed on the vial by the manufacturer. 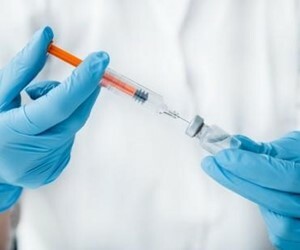 For example, multidose vials of meningococcal vaccine should be discarded if not used within 35 days after reconstitution, even if the expiration date printed on the vial by the manufacturer has not passed. Second, dating opened or reconstituted vials helps manage vaccine inventory by identifying vials that should be used first. To avoid confusion, vaccine boxes should be stored together by type and arranged in rows. Boxes should be stacked according to expiration dates. Vaccines with the shortest expiration dates should be closer to the front of the storage unit compartment for easy access. Store all opened and unopened vials of vaccine in their boxes inside the appropriate storage unit so that their contents and expiration dates are easily identifiable. Trays and containers may be used to organize vaccine boxes. Each tray or container should only store vaccine of the same type. Other medications and biologic products, if they must be stored in the vaccine storage unit, must not be stored on the trays or in the containers to avoid medication errors. Clearly label the tray or container with the name of the vaccine and place vaccine boxes of that type on the tray or in the container inside the refrigerator or freezer. Trays and containers must not be stacked or placed so closely together that air circulation inside the vaccine storage unit compartment is impeded. Never store food or beverages inside the vaccine refrigerator or freezer. This practice results in a frequent opening of the storage unit door and a greater chance for temperature instability and excessive exposure to light. It may also result in spills and contamination inside the compartment. If possible, other medications and other biologic products should not be stored inside the vaccine storage unit. If there is no other choice, these products must be stored below the vaccines on a different shelf. This prevents contamination of the vaccines should the other products spill, and reduces the likelihood of medication errors.